Availability is not affected for those data flows that do not use the failed link. For those traffic flows that use the failed link, the effect consists of the time it takes to detect the link failure and reprogram the indices within the system. When all link connected to a Cisco 6500 are failed (in this case there is only one link for each 6500), the port bundle is converted from a multi-chassis Cisco EtherChannel link to a standard Cisco EtherChannel link, and is treated as a single-homed port. Remember: The supervisor engine on the active virtual switch is also responsible for programming the hardware forwarding information onto all the distributed forwarding cards across the entire Cisco Virtual Switching System. It also programs the policy feature card on the standby virtual switch supervisor engine. For these reasons, both the active and the hot-standby supervisor engine PFCs are active, and are used to perform packet lookups for centralized lookups on each chassis. If a packet is software switched, the packet is sent to the active virtual switch through the VSL. 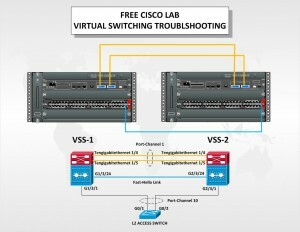 If a packet is hardware switched, the packet is managed by the standby virtual switch. Upon detecting the failure of the active supervisor, the hot-standby supervisor engine performs an SSO switchover and assumes the role of the active supervisor. During the transition, there is a disruption to the traffic that must transition away from the failed chassis. The duration of traffic disruption is determined by the time required to transition the role of the hot-standby supervisor engine to the active supervisor engine, and for the neighboring device to modify its path selection to the newly active chassis. The failure of a single VSL link is discovered by the active supervisor engine, either through a link-down event or through the failure of periodic VSLP messages sent across the link to check the VSL link state. Availability is not affected for those data flows that do not use the VSL. The active supervisor engine discovers the failure of the “entire” VSL either through a link-down event or through the failure of the periodic VSLP messages sent across the member links to check the VSL link status. From the perspective of the active virtual switch chassis, the standby virtual switch is lost. 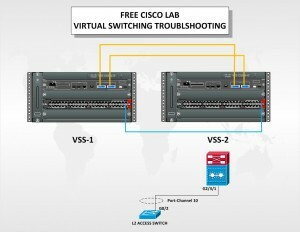 The standby virtual switch chassis also views the active virtual switch chassis as failed and transitions to active virtual switch state through an SSO switchover. This scenario is known as a dual-active scenario and the duplication of this configuration can possibly have adverse effects to the network topology and traffic. In this case the Fast hello link method is implemented. Upon detecting the dual-active condition, the original active chassis enters into recovery mode and brings down all of its interfaces except the VSL and nominated management interfaces. This effectively removes the device from the network. Jan 26 13:23:34.909: %SYS-5-RELOAD: Reload requested Reload Reason: Reload Command.